practice skills such as direct steering, using all 4 aids, backing, sidepass, etc. teach them how to introduce horses to new objects – don’t hold your breath because your horse feels your tension! The IMEHA has a wonderful more thorough description of the different types of trail, with obstacle examples. The Trail classes found at shows were originally meant to imitate objects found on outdoor trail rides, and have expanded to include other fun obstacles as well. According to AQHA, horses are judges on performance, manners, willingness, cooperation, finesse, and success at negotiating obstacles. Points are taken off for knicking, biting, knocking over or stepping out of an obstacle, breaking gait, balking at an obstacle, stepping through the obstacle incorrectly, refusing and displaying disobedience. Riders are disqualified for doing the obstacles in the wrong order, not doing an obstacle, entering an obstacle in the wrong direction, and for the third refusal. put on and remove a vest, slicker, necklace, etc. pole pivot – a pole is placed with one end on a barrel and the other end on the ground. The rider picks the pole up off the barrel and rides around in a circle so the pole pivots on the end that’s on the ground, then places the pole back on the barrel. (This is great for seeting a circle!) (Variation: A rope on the barrel instead of a pole). Outdoor Trail Riding is done outside on a trail on your property, through a park, through a forest, or other similar places outside of the arena. 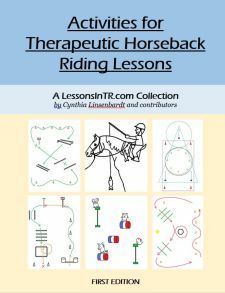 Obstacles are items naturally found in the wild, tasks a rider might encounter on a trail ride, and knowledge about safe trail riding. If you don’t have an outdoor trail to use, you can imitate these obstacles in the arena in many fun and creative ways! take them outside on a real trail ride! don’t tailgate, keep one horse length away to keep horses happy because most don’t like a nose in their rear and will kick! 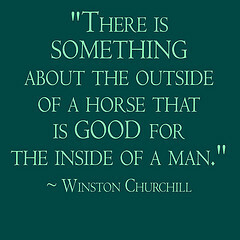 Stuff to bring (in a pack attached to the horse) – teach this through a scavenger hunt! In Hand Trail involves any of the obstacles listed above, but done by leading your horse through them! This is a fun and effective way to practice leading. A great article about the In-Hand Trail Course complete with description and obstacles and tips can be found here. make it like a real show, each taking their turn, have numbers on their backs, with a “judge” – or let them judge each other! Remember that for safety your horses must be rock solid with all obstacles on the ground and with an experienced rider before you have a student do it – even if you are teaching your students how to introduce a horse to new objects. This means you need to take extra time during your week or before the lesson to prep yours horses by introducing them to new obstacles and practicing them until they are solid.